Every year during our annual vacation, shopping for kids books [informative as well as story books] is the top priority. Finally at the end of the trip, the books are in huge volumes and numbers [because they want to possess every book that they come across] and our luggage filled with these books looks bloated up ! So most of the times I end up not buying any cookbooks inspite of carrying a long list. This vacation it was different ... no no their books topped the list but with less time available they were fewer in numbers leaving some space in our suitcase. 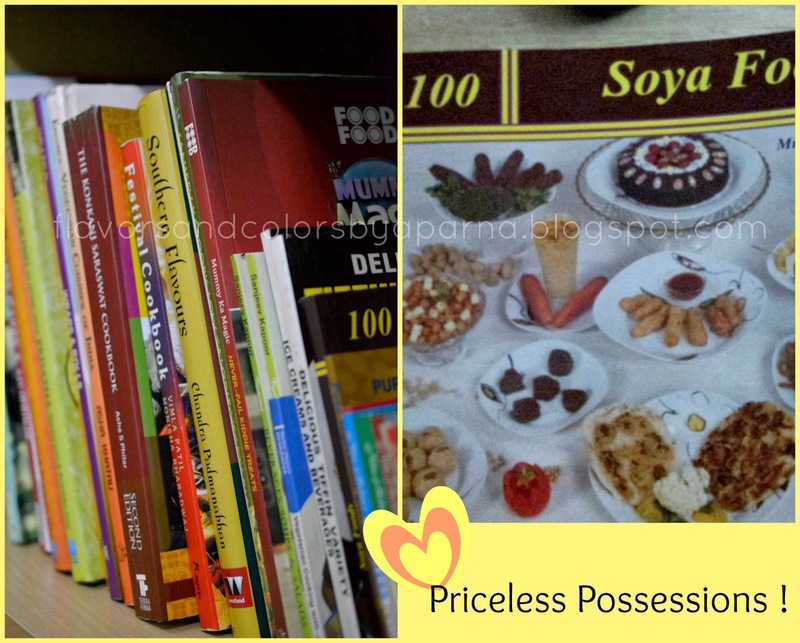 I plan for quick book shopping, head towards Sapna Book House and in no time get deeply engrossed browsing through the vast collection of books from cooking, gardening, crafts, photography to general topics. Amidst this, I happen to meet a person in spotless white khadi kurta and pyjama, we exchange hello and cross our paths after which I realize it was Gulzar saab who happened to visit the stores that particular time. In short, the trip to bookstore turned out to be fruitful meeting famous poet, lyricist and then picking up my collection. I am always on look out for soya dishes and this book listed 100 recipes, all of them eggless and vegetarian,,, that's the reason I instantly picked it up and here goes my first dish from the book. 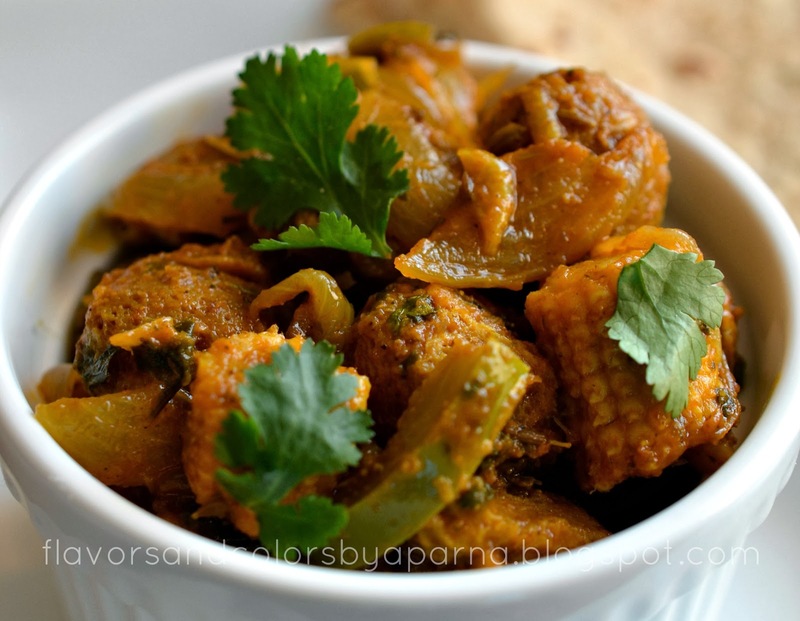 A dry side dish that would go well with rotis or chappatis. This recipe is an adaptation of Soya Potato fry from her book. I have used other veggies instead of potato and quantity of spices altered in proportion to the quantity of ingredients used as well as to suit our tastes. Cut the baby corn into 1" pieces. Keep them aside. Boil soya chunks in water with salt until they become soft. Allow them to cool and squeeze the water out completely from them. Heat oil in a kadai/pan. Add cumin seeds and once they crackle, add sliced onions. Fry them until golden brown.Now add ginger, garlic and saute them till the raw smell disappears. Add sliced capsicum, baby corn pieces and toss the mixture on medium flame for a minute. Simmer the flame and add turmeric powder, red chili powder, coriander powder. Stir it nicely in the pan so that the powders coat the veggies very well. Add toamto puree, drained soya chunks, salt to taste. Sprinkle some water, mix and cook it covered with lid for 5 minutes. Towards the end add garam masala powder, crushed dry kasuri methi leaves, dry mango powder. Mix well and remove it from the flame after a minute. 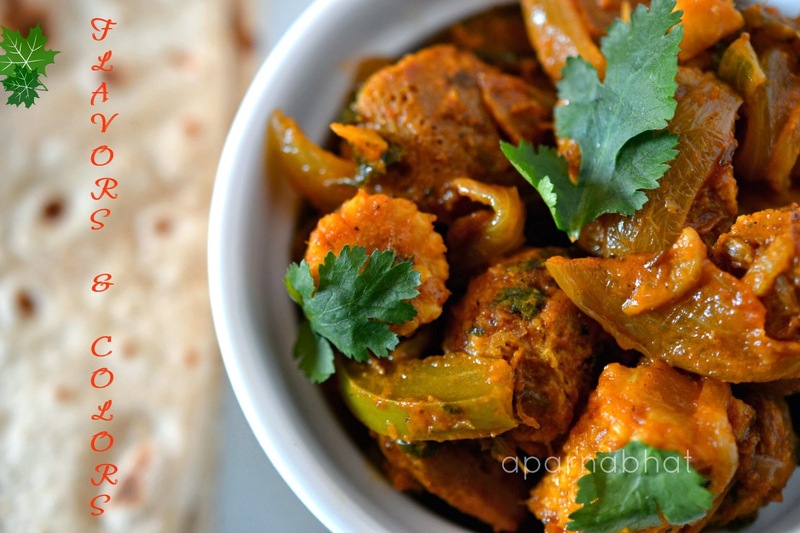 Garnish with coriander leaves and serve it warm with chappati/ rotis or rice as a dry curry. Sending this entry to Healthy vegetarian sidedishes started by Priya, New "U" 2014, Light dinners Dish it out series started by Vardhini events.